The results of an experiment spanning nearly a half-century at the International Institute for Sustainable Development (IISD; Winnipeg, Manitoba, Canada) claim that if water stewards want to stem the growth of harmful algal blooms, they should focus on phosphorus rather than nitrogen. The discovery, made by the same research organization credited with identifying phosphorus as a main driver of algal bloom formation in the 1970s, could change the logic behind municipal pollution prevention approaches. Algal blooms form when nutrients from agricultural runoff and water treatment effluent cause local algae to grow out of control during warmer months of the year. A new study from the International Institute for Sustainable Development (Winnipeg, Manitoba, Canada) claims that phosphorus is a far greater driver of algal bloom formation than nitrogen, a discovery which could change conventional wisdom around handling these phenomena. Eric Vance/U.S. Environmental Protection Agency. Beginning in 1969, researchers with IISD’s Experimental Lakes Area – a system of 58 small Canadian lakes set aside for international hydrologic research – routinely manipulated the carbon, nitrogen, and phosphorus content of entire lakes to study the formation of algal blooms. Algal blooms form when nutrients from agriculture, water resource recovery facilities (WRRFs), home septic tanks, and other vectors accumulate in waterways. 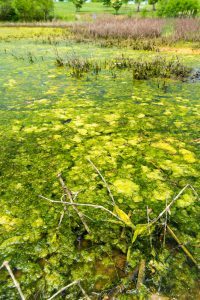 These nutrients cause local algae to grow out of control during warmer months. By choking oxygen out of the waterway and producing chemicals that are toxic to humans and marine organisms, larger algal blooms oftentimes make drinking and swimming in affected waters a dangerous proposition. After learning early in the experiment that heightened nitrogen and phosphorus levels spurred the growth of algal blooms more so than other substances, the researchers began to look closer. About 40 years ago, researchers gradually began to reduce the amount of nitrogen they added to the test lakes. By 1990, they stopped adding nitrogen altogether. As of 2013, algal blooms had formed annually on the test lakes despite no influx of nitrogen in more than two decades, according to a news release. “When governments are tackling algal blooms while working with limited resources, these results demonstrate that their efforts should be firmly focused on reducing phosphorus loading in lakes,” said Michael Paterson, senior research scientist at IISD. While water quality stakeholders in the Great Lakes region generally understand the problem of phosphorus pollution, agreeing on the best ways to address that problem remains murky. 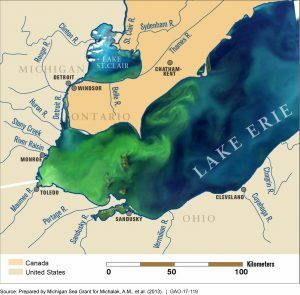 In the summer of 2014, a massive algal bloom in Lake Erie prompted the City of Toledo, Ohio, to halt its withdrawals from the lake. Without a safe drinking water source, more than 400,000 Toledo residents were forced to rely on bottled water for 3 days. Returning every summer since, Lake Erie’s chronic algal bloom problem has prompted a controversial proposition from the Ohio Environmental Protection Agency (OEPA) that will likely affect state WRRFs. Situated at the edge of Lake Erie, the City of Toledo, Ohio, acts increasingly as a protector of water quality in the ecosystem. To stem the flow of phosphorus into Lake Erie, the Ohio Environmental Protection Agency is proposing a broad-reaching plan that would prompt state water treatment facilities to install upgrades. U.S. Government Accountability Office. With a measure slated for debate in early 2018, OEPA hopes to keep approximately 907,180 additional kg (2 million lb) of phosphorus each year from ever reaching Lake Erie’s shores, according to The Associated Press. To do that, the agency will first turn its attention to Ohio WRRFs. If passed, the measure would extend the 1 mg/L total maximum daily load currently imposed on WRRFs immediately adjacent to the Great Lakes to nearly 1700 additional WRRFs throughout the state. It also would require these facilities to make costly upgrades to their treatment processes focused on phosphorus reduction. Local utility leaders voiced skepticism with the proposal, arguing that the projected $15 to $20 annual rate increase for household water customers combined with the hassle of instituting mandatory system upgrades — especially for smaller facilities — may not have a worthwhile effect on the problem. Reports from both state and federal-level environmental agencies agree that phosphorus loading from agriculture greatly outweighs the contributions of all other sources, including from WRRFs. OEPA faced similar fallout when it proposed a broad-reaching plan to limit phosphorus discharges from agricultural lands in 2016, with critics arguing that the plan did not reach far enough to properly address the root of the problem.